Oops - we don't appear to have a video for the i830. Simultaneous output of bitonal and color images at full speed. Fast, smooth document feeding and virtually no work stoppage with SurePath paper handling. Outstanding image quality from Kodak's exclusive Perfect Page Scanning, now with the iThresholding feature. Great OCR/ICR read rates with electronic color dropout. And when you decide it's time, an upgrade path lets you add color scanning and throughput speed to meet your growing business needs. Best of all, these benefit-rich scanners come with all the speed, reliability and ease of operation you expect from Kodak. High-performance features for greater flexibility. Built-in Perfect Page Scanning, which now includes the benefits of our new iThresholding feature, allows you to scan more bitonal and color documents, more automatically than ever before. Perfect Page deskews images, crops borders and smoothes edges on text. The iThresholding feature is essential for high workloads with mixed documents. It easily handles more of your tough imaging challenges?as well as your everyday scanning with minimal document prep and rework. So you'll spend more of your time scanning and less time getting ready to scan. The i800 Series now comes with even more flexibility. Simply by scanning our unique patch code, you can automatically switch "on the fly" between color and bitonal scanning, as often as needed. Custom adjustments using our Brightness and Contrast Control feature allow you to choose the best color output for your application. You can use the default color tables provided, or create and save your own, for color the way you need it. Load a batch and go. 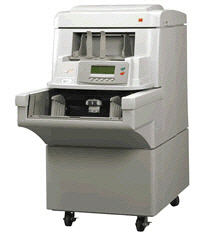 KODAK SurePath paper handling delivers fast, streamlined document feeding that's virtually jam-free. It includes the QuickSet elevator, with a generous 1,000-sheet capacity and an auto-reset mechanism that returns the elevator directly to the batch position you set. It also includes 3-D multi-feed detection. Our most reliable detection system ever, it uses ultrasonic technology so it's not fooled by adhesive labels or varying paper thickness.